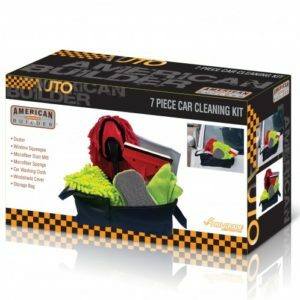 7-Piece: American Builder Car Cleaning Kit is now available at dailysale.com for just $24.00 (REG $79.99) (As of 14 April 2019, 18:36 PST – Details) with $55.99 (70%) Savings. Windscreen Cover-This acts as a protective shield against dirt and dust. Its simplistic design makes it easy to install and secure. Car Washing Cloth- This soft, thick, premium quality fiber serves as a great wipe for the interior and the exterior of the vehicle. Its good water imbibition ensures that there are no water stains, giving the car a super polished look always. Microfiber Sponge-Super soft microfiber sponge safely lifts and removes dirt and dust from the surface. It’s easy grip shape lends itself to comfortable and thorough cleaning. Washable and reusable. Window Squeegee- It has a soft comfortable handle even when wet. The design provides a smooth resistance free swipe. Its use ensures a streak free window always. Microfiber Dust Mitt- This super soft dust free mitten is a convenient and complete way of removing the dust and grime. Its microfiber noodles easily go into the crevices and clear it from the offensive particles. Duster- The duster serves as a loyal assistant as you thoroughly clean the different surfaces. Storage Bag- Collect and store all your car cleaning accessories in a neat and compact manner. The entire set fits snuggly into the smart storage bag provided. This 7-pc set of car cleaning accessories from American Builder ensures that your vehicle is always sparkling and dust free. Each of the 7 accessories serve their role as specialized cleaners thoroughly and honestly.